Trust in government by American citizens is at an all-time low. According to a 2015 Pew Research Center survey titled “Beyond Distrust: How Americans View Government,” only one in five Americans have trust in the government. At first glance, the survey casts a dark cloud over any agency attempting to initiate specific projects. 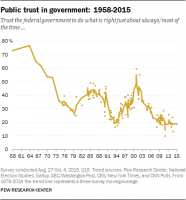 It indicates a multi-decade decline of public trust in government, a lack of faith in our elected officials and a polarized electorate. A lack of trust in government and lack of faith in those attempting to implement change surely casts doubt whether an electorate would support any endeavor initiated by any government agency. Interestingly, a closer look at the survey revealed fascinating information contrary to a lack of trust and faith in government. During a more thorough examination of the survey results, critical information surfaced involving the interpretation of government performance and the role of government in certain activities. Citizens gave high marks when evaluating government performance and in evaluating its role in specific areas of public concern. These findings are completely contrary to the expectation of results from citizens who lack trust and faith in government. Armed with these discoveries, we can open doors where barriers once obstructed. Understanding these areas of public concern and a perceived public willingness to support programs associated with these concerns may create opportunities to influence future government endeavors. The lack of trust and faith in government, indicated in the 2015 Pew Research Center survey, is surprisingly counterbalanced by citizen satisfaction in performance. The survey reveals a near 50/50 split on whether the federal government should do more to solve problems in 13 different areas. In five specific areas of the survey, the perceived performance of the federal government was rated very high. Furthermore, there are indications the desired role of government in those same areas should be increased. 94 percent say government should play a major role in keeping the public safe from terrorism. There is a 72 percent somewhat good – good grade when evaluating the performance of government in this area. 88 percent say government should play a major role in disaster response. There is a 79 percent somewhat good – good grade when evaluating the performance of government in this area. 87 percent say government should play a major role in safe food and medicine There is a 72 percent somewhat good – good grade when evaluating the performance of government in this area. 76 percent say government should play a major role in maintaining infrastructure. There is a 52 percent somewhat good – good grade when evaluating the performance of government in this area. 70 percent say government should play a major role in insuring access to a quality education. There is a 52 percent somewhat good – good grade when evaluating the performance of government in this area. Based upon these findings, it could be assumed if one could relate any specific endeavor to one of these five specific areas, there would be substantial support for the project; as much as 70 percent or possibly more. Understanding citizen expectations and desires is paramount when attempting to initiate any program or agenda affecting those same citizens. Being able to show citizens how a mitigation project not only works to improve infrastructure, but also how it helps to protect communities by reducing the impact of disaster upon the community, goes a long way when searching for project support. For instance, a levee project could be associated with building and maintaining critical infrastructure, as well as providing protection against flood, thus reducing the impact to your community, home, family and friends. The purchase of detection equipment for hazardous chemicals could be related to protection from terrorist activity, increased ability to respond to that specific chemical disaster event and also for safe food and medicine, where vaccines and serums would be needed to combat the hazardous chemicals. Perceived barriers to progress by organizations and government create the only impediment to advancement. The 2015 Pew Research Center survey provides evidence trust in government and loss of faith in select public officials are essentially moot points if you can provide citizens with an understandable, transparent motive for the endeavor or project you wish to initiate. Further, describing how your specific project would benefit their community, home and family will most likely obtain the support you seek. Author: Chuck Wallace is an emergency manager in Grays Harbor County, Washington. He has an MPA and speaks throughout the country on issues related to emergency management barriers and practice. His email is [email protected]. What population of people were surveyed? Is there somewhere you can see these results? I am curious where the data came from. In my opinion, the media has a lot to do with how the public views the government. Stories that are “news worthy” all seem to be negative.